FY18 inflow till Nov at Rs 110,791 crore; industry AUM at all-time high Rs 22.79L crore. 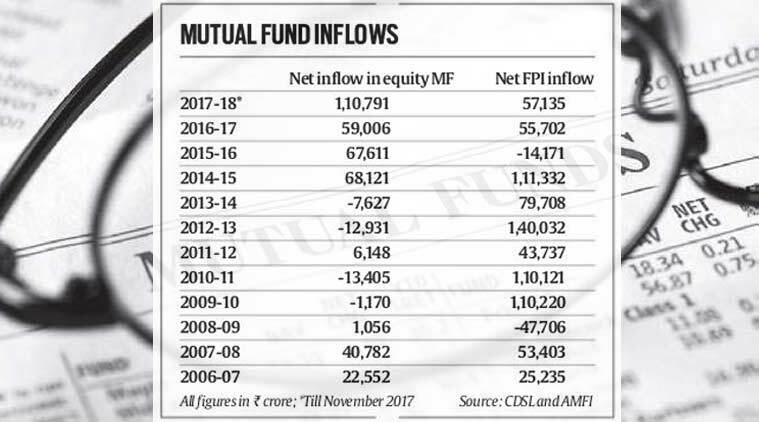 While the inflow into equity schemes of mutual funds have remained strong over the last three years, the current fiscal has witnessed a big surge in inflow over that seen in the last three years. With equity markets continuing to outperform all other asset class, the net investments into equity mutual funds in November amounted to Rs 19,508 crore, the second highest monthly inflow ever. The previous high was Rs 19,515 crore in August 2017. With the help of November investment figures, the net inflow into equity schemes of mutual funds for the current fiscal crossed Rs 100,000 crore for the first time in a financial year at Rs 110,791 crore between April and November 2017. According to data released by Association of Mutual Funds in India (AMFI), the aggregate asset under management (AUM) of the mutual fund industry hit an all time high of Rs 22.79 lakh crore at the end of November 2017 and the equity AUM for the industry too hit a new high of Rs 656,269 crore. While the inflow into equity schemes of mutual funds have remained strong over the last three years, the current fiscal has witnessed a big surge in inflow over that seen in the last three years. With four months to go, the net inflow into equity schemes already amounts to Rs 110,791 crore, which is significantly higher than the previous high of Rs 68,121 crore seen in 2014-15 when Narendra Modi led NDA came to power. AMFI data shows that there has been a sharp rise in the fresh investment from B-15 cities. Assets from B15 locations have increased from Rs.2.79 lakh crore in October 2016 to Rs.3.89 lakh crore in October 2017 witnessing a 39.3 per cent growth in assets for B15 locations. Against this the industry as a whole grew by 30 per cent during the same period. The biggest gainer of the rise in equity markets, inflow of retail investment and physical assets (gold and real estate) not performing well have been equity mutual funds. The equity AUM for the industry has nearly quadrupled from an AUM of Rs 166,826 crore in April 2014 to Rs 656,269 crore as of November 2017. In the same period the industry AUM has growth from Rs 945,321 crore to Rs 2,279,032 crore. In each of the last five months, the net inflow into equity schemes has stood above Rs 10,000 crore and that is something that the market has never experienced. As against MF inflows which are domestic investments, the foreign portfolio investment (FPI) has lagged significantly. In the current fiscal (till November), the FPI investment into Indian equities stood at Rs 57,135 crore which is nearly half of what has been received by mutual funds into their equity schemes.